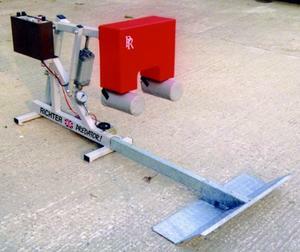 Individual trainer - Freestanding and portable. Intended for advanced training with the help of a coach, the Mono can be used successfully in a more limited way by the player alone. 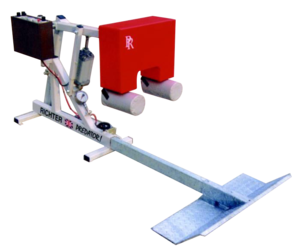 Powered by compressed air, under the fingertip control of the coach, multi-directional movements accurately simulate scrummaging against live opposition. Advanced technology allows scientific analysis of an individual player's technique and a variety of related bio-mechanical studies. The machine provides a meaningful addition to conventional weight-training and under proper medical guidance, can assist in injury rehabilitation. An individual player's scrummaging performance can be subjected to in-depth scrutiny and analysis. The precise measurement of the player's efforts against variable resistances together with repeatable pressure settings provides irrefutable proof of performance. The PREDATOR! Mono stimulates an individual's enthusiasm for progressive training schedules. Individually tailored MONO training programs vastly increase a player's ability to apply power and greatly improve his muscular endurance, self confidence and commitment. Portable free-standing design which is an ideal addition to existing weight rooms or gymnasium areas. Player has a clear view of the force gauge and can exert himself correctly and safely for the training objective.